Europe’s history has always been characterised by shifting boundaries, political and economic upheaval, migration and the displacement of people. Only with historical distance can we truly see the bigger picture. As the debate about the future of Europe continues, we have asked 12 artists to imagine themselves in the year 4017, looking back and making sense of where we are now. Rosa Barba's film tells the story of a man who is losing his eyesight. A friend tries to help him memorise the objects in his home before he goes blind. Images of a night flight over an archipelago become a metaphor for the man's search for his memories and the disappearance of a previously certain world. The film urges us to reconsider our environments, exploring the beauty of disintegration through the patterns of experience of a place that doesn't exist anymore. Rosa Barba lives in Berlin. She is interested in film and the way it articulates space, placing the work and the viewer in a new relationship. Her works are situated between experimental documentary and fictional narrative. Thibaut de Ruyter has taken the track 'A Song for Europe' by Roxy Music as his starting point. 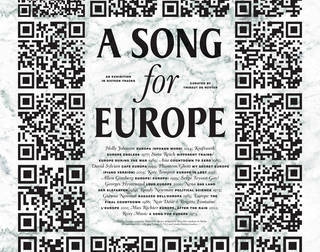 Thibaut's artwork – a curated list of songs in the form of a poster – discusses the idea of Europe at a historical, ironic or personal level. Music, both underground and mainstream, has played an important role in the artist’s cultural education. Take a poster to 'listen' to the exhibition from anywhere at any time. Thibaut de Ruyter is a French architect, curator and critic. 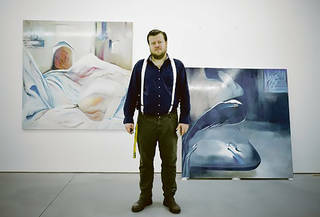 He has lived and worked in Berlin since 2001. As artificial intelligence progresses, so-called 'convolutional networks' (ConvNets) now exist that can recognise objects within photographic images. Constant Dullaart has retrained these image recognition networks to include European artefacts, creating an image dataset. 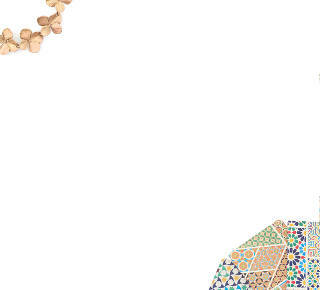 He asks, 'How can Europe's diverse cultural output be represented within this dataset, and what is the networks' capacity to recognise what is deemed European?' 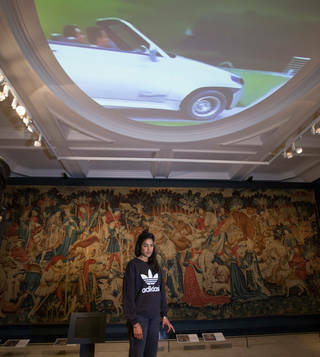 By illustrating the networks' ability to draw out cultural bias, Dullaart shows mechanised image interpretation's understanding of Europe in 2017. Constant Dullaart was born in the Netherlands. He reflects on the cultural and social effects of communication and image processing technologies. 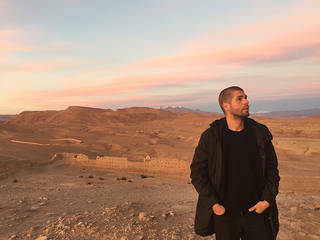 His work includes websites, performances, fake armies and manipulated found images, presented both offline and in the public space of the Internet. Imagine a future where European citizenship isn’t bound by geographic borders. This is the world of Europa, an imagined collective that offers digital or ‘parallel’ citizenship to anyone, granting citizens the rights and social security that were once provided by the nation state. 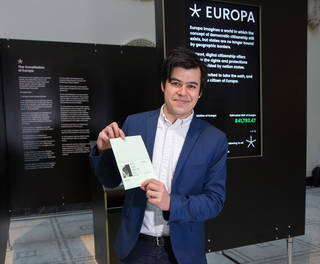 Take a pledge to become the first citizens of Europa, and leave with a ‘Europan’ passport. Be sure, however, to read the footnotes in the bill of rights: if over one million people sign up for provisional citizenship, Europa will become real. Europa is a collaboration between IF, a design studio that seeks to change how people think about data, privacy and security, and 00, a group of innovation firms working across architecture, policy, social science and technology. IC-98 and Kustaa Saksi have created a contemporary millefleurs tapestry (a pattern of thousands of flowers) that transports us 2,000 years into the future. Sea levels have risen and the human race is long gone, but its effects are everywhere. 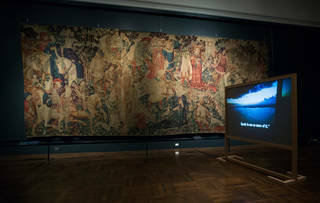 The tapestry imagines the site where the Svalbard Global Seed Vault once stood. Here, seeds forecast to thrive in the tropical climate of the future have sprouted into lush forests. 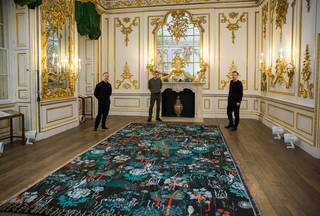 The actual seeds of depicted plants are woven into the fabric of the carpet, which becomes a path reclaimed by nature, pregnant with the future inhabitants of Europe. IC-98 is a Finnish artist duo comprising Patrik Söderlund and Visa Suonpää. They are known for their animated film installations, which combine classical drawing and digital effects, often depicting landscapes shaped by nature and technology. Kustaa Saksi is a Finnish artist and designer who specialises in graphic storytelling through pattern design and textile art. Using found footage of European locations taken from popular Indian films, Jasleen Kaur creates a visual account of Europe fabricated from an alternative cultural perspective. As a result, Europe suffers from stereotyping. It is simplified into National Trust buildings, bustling cosmopolitan cities and romantic landscapes. This pseudo-documentary provokes questions around the representation of cultures, and imagines a future where the history of the West is written by the East. Jasleen Kaur is a Scottish Indian artist based in London. Brought up in a traditional Sikh household in Glasgow, her work is an ongoing exploration of the malleability of culture and the layering of social histories within materials and objects. In the year 4017, how might identity and territories be transformed by technological advances? What if Europe ceased to be a fixed continent and became a land mass with borders changing daily according to data flows? This project has worked with secondary schools to imagine the future of European citizenship. 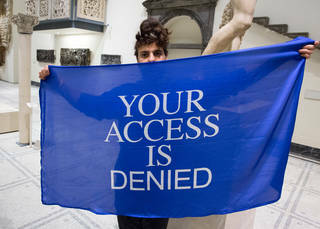 Presented as an alternative museum tour, outcomes of the workshops form the basis for performances around the V&A. Onkar Kular is Professor of Design Interventions at HDK, Gothenburg University. His work examines contemporary design practice and its relation to cultural and popular issues. Common Initiative, made up of four designers – Rike Glaser, Thomas Marriott, Adi Zaffran and Namuun Zimmermann – asks if design can function as a form of ‘activated journalism’ to reconsider ways of understanding the world. 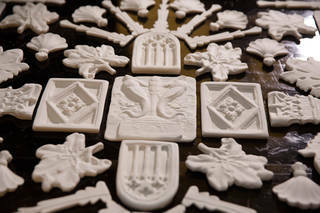 AVM Curiosities have created a contemporary sugar sculpture that takes inspiration from European architectural heritage. Historically, sugar sculptures were synonymous with luxury and power. Alabaster Ruins combines ancient and modern techniques, using a 17th-century ‘sugar-plate’ recipe alongside 3D printing technology. It brings together fragments of English Tudor, French Gothic, German Baroque and classical Greek structures. The forms, scanned and cast from the V&A’s collection, are transformed into transient ruins. They point to the ephemerality and consumption of European culture, and the Museum’s urge to preserve it. Founded by food historian Tasha Marks, AVM Curiosities champions the use of food as an artistic medium with projects ranging from exhibitions and sculptural installations to interactive lectures and limited edition confectionery. Tipu’s Tiger is one of the V&A’s most popular objects. It is an 18th-century automaton from South India of tiger devouring a European army officer. How might future visitors react and understand it in 4017? The Return of Tipu’s Tiger is a communication from the future, channelled by Raqs Media Collective, where the tiger has become an uncanny meme for Europe’s presence in the world. It is meant as a funny, fantastical reminder of the ongoing battle between defeat and victory, man and nature, history and mystery. Raqs Media Collective appear as artists, curators, sometimes as philosophical agent provocateurs. They have created installations, exhibitions and art installations across the world. EU, 2017 is an abstracted version of the final part of Beethoven’s Symphony No. 9. This iconic composition has been used at historical moments, and is now the official anthem of the European Union. Remco Torenbosch was born in the Netherlands. His practice focuses on the historical and contemporary relationships between socio-economics and the hierarchies in the global distribution of labour. Archaeologists in 4017 have discovered a large metal plate of unknown origins and function. It is decorated with relief printings that appear to be deformed but in fact are motifs taken from daily life. These were created by the artist through a process of moulding, casting and corrosion. They are false cultural relics posing the question ‘what is Europe now?’ What might happen during the next 2000 years to leave us with discovered cultural relics like this? War? Natural disaster? Or just time? 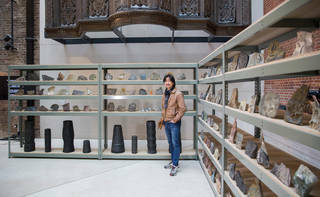 Tu Wei-Cheng is one of Taiwan’s leading artists. His work creates modern scenes using ancient art forms as the present turns into an imaginary past. The artist takes on the role of archaeologist or historian, revealing reflections of ourselves and our time. These performances by Fru*Fru bring to life three different futuristic bathroom situations, performed within a technological set. 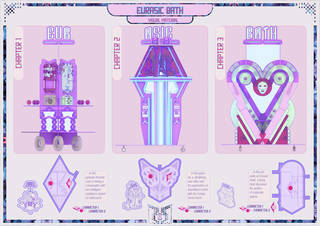 Eurasic Bath sees the overlapping of culture and technology, building a Eurasic identity of intimacy and consumption. The use of technology in these future imagined bathrooms promotes the creation of blurred identities by turning intimate spaces into performance stages. Fru*Fru consists of the duo Rosana Galián and Paula Vilaplana. Their work explores domesticity, media formats and contemporary mass media languages. It includes performances, management of events and research.